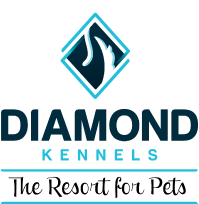 Diamond Kennels is proud to provide the highest quality of pet care possible while still keeping your budget in mind. Located in a separate area than our canine guests, each of our spacious kitty condos can comfortably house up to two cats, or you can opt to reserve a connected condo for even more space (and cats!). Kitty City offers multi-level suites, each with a window overlooking the outdoor landscape, as well as a twine scratching/climbing post to help our guests stay active and entertained. Soothing music plays throughout the area 24/7. Our staff cleans each lodging space twice each day (including litter pans), and fresh water is always available. Kitty City also has its own air circulation system to ensure a comfortable environment. fleece pads and a window. Each roomy Condo has four levels, a large window with fleece-lined ledges, a climbing post, a litter box (cleaned twice a day), and lots of sunshine. A condo can comfortably house one or two cats. Each Connected Condo has 8 levels, 2 large windows with fleece-lined ledges, a tall climbing post, two litter boxes (cleaned twice a day), and lots of sunshine. A Connected Condo can comfortably hold up to four cats. One-On-One Playtime with Bacon Bubbles: a fun 15 minute play session with a staff member who scatters bacon-scented bubbles into the air with our bubble machine! Movie & Popcorn: pick out a favorite dog-themed movie served with a bowl of popcorn! We make every effort to ensure that your pet’s vacation with us is as stress-free and enjoyable as possible! Bringing your pet’s own food and a few familiar items from home will help your pet adjust much faster. Please bring your pet’s own food (dry and/or canned and/or frozen). If you free feed (leaving a bowl of food out so your pet can graze), please make sure you bring more than enough food to last. If you bring a plastic container, it should be small enough to fit on a shelf. It is difficult for us to store large storage containers and large bags of food. If your pet also eats canned or frozen food, bring that as well. Don’t bring canned food if it is not part of your pet’s regular daily diet. A new food can often cause digestive problems. Bring enough food for one or two extra days, in case your return gets delayed. We will feed your pet according to your directions. We typically feed your pet twice per day (morning and evening), but can add as many additional feedings as your pet requires for a nominal charge. We can also free feed (leave food out all day). If your pet has any food allergies or sensitivities, please mention those when checking in. If your pet runs out of food prior to their scheduled departure, we will contact you to let you know, and ask if you want us to provide our kennel food for them (at a daily charge) or purchase their current food (at your cost, including pick-up fee). You do not need to bring bowls or measuring scoops/cups. If your pet regularly eats from a raised feeder or a slow-feed bowl, you may bring that so we can place it in their room for meals. Your pet will always have access to fresh water. If your pet has a favorite treat or snack, please bring it! Every pet likes to have a little extra treat while on vacation. Please don’t bring anything that could be a choking hazard. You can also take advantage of our optional treat menu for our feline guests! You may bring your pet’s blanket, towel, or unstuffed mat from home, but we must be able to wash it in case it gets soiled. Please do not bring beds stuffed with fiberfill or foam. You may bring your pet’s favorite toy, but remember, you won’t be there to interact with your pet, so often toys go untouched because there is so much going on in the kennel all day! If your pet likes to remove stuffing, please do not bring those types of toys! Toys containing squeakers or rope toys are not recommended due to potential choking hazards or consumption. If your pet is currently taking oral or topical medication or supplements, please bring the pills, powders, ointments, or liquids in their original container so we know the exact name, dosage, and dispensing instructions for each medication. This could be important information in the event of an emergency and we cannot contact you or your vet. A detailed card will be filled out for each medication so our staff can properly and safely dispense what your pet needs. There will be a daily charge for dispensing medication. We do not give injections of any kind. Proof of vaccinations must be on file with us prior to arrival. Your vet can usually fax that information to us. All vaccinations must be in place at least five days before arrival. We cannot board your pets without proof of current vaccinations. Dogs: Annual Bordetella (Canine Cough), distemper, and rabies. Cats: Distemper and Rabies (Feline Leukemia recommended but not required). Please make sure we have correct contact information for you, as well as your emergency contacts and veterinarian. We can store up to five emergency contacts, so let us know if you would like to add anyone to that list. Also, make sure we have the correct veterinarian listed for your pet. It is always a good idea to contact your vet to let them know you are leaving your pet in our care, and we have permission to make decisions in case there was an emergency and we could not get in touch with you. We will administer your pet's medication for a nominal charge per day. Please be advised that we do not give injections of any kind. It is important that you bring all the prescribed medication/supplements/OTC medications in the original container so we know the exact drug name and dosage. This could be critical information in the unlikely event of an emergency, and we could not get in touch with your veterinarian.